The Night Comes for Us, the blood-splattered Indonesian crime thriller that arrived on Netflix last week, takes a holistic approach to its action sequences. When a fight breaks out in a given environment, whether it's a grubby butcher shop or the backroom of a night club, every part of the setting can and will be used to inflict acts of brutal ultra-violence -- no space is wasted, no object neglected. For example, you've probably seen a brawl around a pool table before -- think of the billiards beat-down's in Mean Streets, Rush Hour, or Out for Justice -- but have you ever seen a man remove the netted pockets from the table and wield them as a weapon? Probably not. As mainstream Hollywood action movies increasingly prioritize computer-generated spectacle over hand-to-hand combat, a little carefully choreographed mayhem can go a long way. The success of the John Wick films, along with the the acclaimed cult status of both The Raid and The Raid 2, show there's still an eager audience for stylized stunt-work and close-quarters scuffles. Given its track record of investing in stomach-churning material that major studios might shy away from -- the company recently released Apostle, the less action-oriented follow-up from The Raid director Gareth Evans -- it makes sense for Netflix to want in on the carnage. 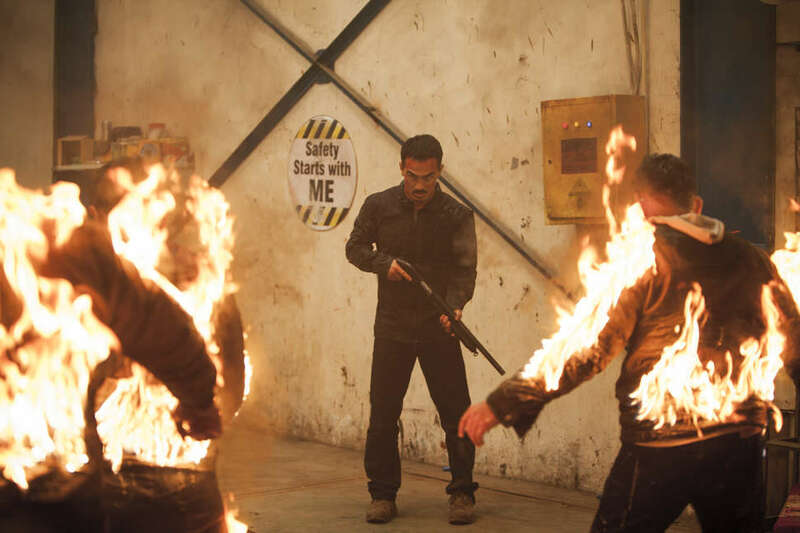 Written and directed by Timo Tjahjanto (Headshot), The Night Comes for Us shares key cast members, Joe Taslim and Iko Uwais, and an unflinching sensibility with Evans' martial arts epics, but it also pushes the frenzied go-for-broke aesthetic into a gross-out, cartoon-like realm. In telling the story of a Triad-trained super-assassin named Ito (Taslim) who goes rogue and grows a conscious after being ordered to kill a young girl, Tjahjanto uses crime saga clichés about brotherhood and friendship as meat hooks to hang his action set-pieces on. Your patience with the paper-thin characters, obvious dialogue, and confusing plotting will likely depend on your affection for scenes where mobs of bad guys swing machetes like children running around with sparklers. It's not that Tjahjanto doesn't spend time attempting to get the viewer invested in Ito's plight. After some text-on-screen exposition about the Six Seas, a group of "elite delegates" allowed "free reign to employ extreme measures," we see a young girl (Asha Kenyeri Bermudez) wake up on a beach with sand on her face. She witnesses her family getting gunned down and spends the rest of the movie running from one perilous situation to the next. Though she's the person most of the characters in the movie are either protecting or attempting to kill, the film doesn't stay with her perspective for long or give us a sense of what matters to her. (At one point late in the film, she hops out of a bathtub covered in pillows and I was surprised she was still alive.) Ito risks everything for her, but he's not particularly interested in getting to know her. Instead, the relationship between Ito and his estranged best-friend-turned-Triad-goon Arian (Uwais) is given the most screen time. After his frustrating appearance in the forgettable Mark Wahlberg vehicle Mile 22, it's refreshing to see a gifted on-screen fighter like Uwais really get to to show off his skills here, but there's also a large supporting cast to introduce. In addition to Arian, we meet Ito's makeshift family and a handful of stock video game villains, like an assassin who uses piano wire to slice up her victims. Again, don't get too attached to these characters; they won't be around for long. None of this would work if the action scenes weren't so relentlessly committed to making you gasp, wince, and recoil in horror. The movie's butcher shop fight sequence is the best set-piece in the film and it plays like a stressful inversion of Netflix's latest cooking show Salt Fat Acid Heat. (The Night Comes for Us could be called Sweat Blood Guts Meat.) Long after a similar fight scene in a more conventional movie would end, this one just keeps going and going, incorporating racks of beef, gnarled bones, meat hooks, and buzz saws to terrifying, blood-spraying ends. Even from the comfort of your couch, you might wish you were wearing a waterproof poncho. If there's a problem with a movie like this, one clearly designed to appeal to seen-it-all genre fans with a high tolerance for throat-slitting and boxcutters going through cheeks, it's that Tjahjanto and his collaborators often feel like they're working off of a gruesome checklist. There's a fight inside the back of a car, a fight in an apartment, a fight with a bunch of henchmen wearing sweatpants, and an absurdly long climactic fight between our two main characters where they slash each other up into tatters. How long can you watch this stuff before it becomes exhausting? When one character says, "It all ends here," you might find yourself praying he's not lying. Instead of feeling like the action organically emerges from the situational demands of the narrative, it often feels like the story was reverse engineered to center around the often stunning physical feats. As a filmmaking approach, that's not necessarily a bad thing -- this summer's blockbuster hit Mission: Impossible - Fallout was clearly conceived as a string of stunning set-pieces tied together with witty spy-craft plotting -- but it puts pressure on the writer and director to make the connective tissue feel authentic, or at least fun. Tjahjanto and his cast are so good at hacking things up, you wish they'd learn to stitch a little better, too.